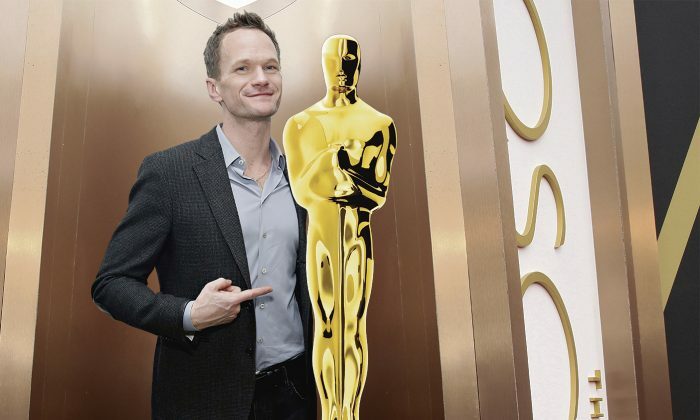 Neil Patrick Harris hosts the Oscars for the first time Sunday night. If his past hosting gigs are any indication, tens of millions of viewers are in for a treat. The actor and Broadway star had previously delighted the crowd with the opening number for the 2010 Oscars. “I know, what am I doing here?” he joked before breaking into song complete with a sparkling black suit and back-up dancers in white feathers. The much-loved performance, which garnered 2.5 million views on YouTube, was only one of many occasions the actor has entertained on the award ceremony stage. He has hosted the Tony Awards four times, tying with Hugh Jackman for second most frequent host. The two shared a duet and comical verbal spar in 2011, where Jackman jokingly made fun of Harris for never having hosted the Oscars. In a mash-up of Broadway songs, they sang a cover of Annie Get Your Gun‘s Anything You Can Do where Jackman impressed Harris with his ability to get better gift bags and their spar became an exchange of compliments in a cover of You’re The Top from Anything Goes. At the same 2011 show, Neil Patrick Harris brought the microphone to the audience and had Brooke Shields and Bobby Canavale contribute to his song. Harris is also well-known for his television roles, having played serial womanizer Barney Stinson on How I Met Your Mother for nine seasons. He has hosted The Primetime Emmy Awards twice—in 2009 and 2013. His opening number for the Emmys in 2009, Put Down the Remote was a heartfelt appeal to the TV audience to stay tuned. “Every note from this throat is like a not to be Tivo’ed kiss,” he sung with gusto. Then, in 2013, as he hosted the Emmys again, his act was a little cut off by several hecklers in the crowd—all scripted, of course. Jimmy Kimmel was the first to interrupt, followed by fellow talk show hosts Jimmy Fallon and Conan O’Brien. Then, as a private aside to the audience, Kevin Spacey revealed he orchestrated the entire charade as revenge for not being chosen as host that year. Finally, just as Neil Patrick Harris resumed control over the situation, he was heckled (again!) this time by Tina Fey and Amy Poehler who wanted to see him twerk. Still, Harris’s most epic moment hosting award shows came three months earlier, during the Tony Awards held that year at Radio City Music Hall, where he threw the show of his life. First, he assumed an Irish accent and a guitar for a ballad that quickly descended into showtune. “I guarantee a truly legendary show,” he sung, in an elaborate musical number involving a disappearing act and a line dance with newsies. It culminated in him climbing up the side of a giant Tony Award and hanging off it with a smile, to the wild cheers of the crowd. “That’s the definition of a tough act to follow,” said actor Zachary Quinto, who took the stage after.